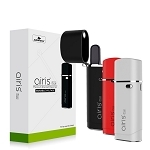 The Airis Mystica 2 in 1 Kit is a newly designed Mystica vaporizer that now comes equipped with interchangeable cartridges that are each designed for use with oils of a variety of consistencies. 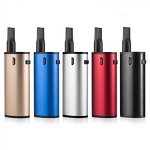 This iteration to the Mystica vaporizer series features a compact and pocket-friendly body just as it's predecessor's. Measuring in at around 2.5" tall by about an inch wide, the Mystica 2 in 1 Vaporizer can easily be hidden in the palm of your hand while you take quick and stealthy vape sessions on the go without anyone having a clue as to what you are doing. Airistech now includes two oil heating attachments that can be quickly interchanged for ultimate versatility. Whether you prefer vaping thin essential oils or those of the thick, waxy variety, Airistech's Mystica 2 in 1 vaporizer comes with an attachment that can handle just that. 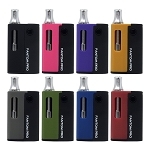 Each of these attachments utilize the convenient magnetic adapter connection that makes replacing cartridges a fast and thought-free process. Airistech includes two of these mini adapter rings to allow you to keep one on each of your cartridges in order to ensure each is ready to go at all times. Once one is empty simply pull it out, drop in a new one and the magnets will create a strong and reliable connection. The cartridge for thin essential oils features a similar design to the one included with the original Mystica and Mystica VV vaporizers. 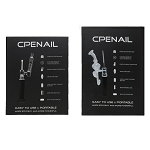 This attachment now comes equipped with an all metal tip for enhanced durability and it is capable of holding up to around 0.8mL of thin oils at a time for all day vaping, perfect for travel use. For thick waxy essential oils, Airistech includes a similar style cartridge that comes equipped with a pure glass quartz heating element. This cartridge utilizes a glass quartz dual rod design that offers increased surface area for great efficiency and the glass quartz element delivers an extremely clean-tasting vapor that simply cannot be matched by other materials like ceramic and fiber wicks. The Mystica 2 in 1 Vaporizer features an oil window on the side of the device that offers a clear view into your heating attachments. In just a moment's notice you can quickly glance down and see exactly how much oil you have left remaining inside without ever having to open or take apart the device, perfect for discreetly checking oils levels when out in public. Airistech's Mystica 2 in 1 Kit also features an embedded 650mAh lithium-ion battery that utilizes a convenient micro-usb charging method. This battery will vape for days at a time before needing a recharge, when that time comes an LED light indicator will quickly flash 10 times to let you know it is time to recharge. This battery also features a user-friendly one button operation that gives you full control over the device using just one button, click 5 times to lock/unlock or press and hold to heat your oils, it is just that simple.